Scientists are one step closer to making sure you never have to worry about the flu again. A group from Oxford University has developed a vaccine that could potentially protect us from all possible forms of the flu, even ones that don't yet exist. Traditional flu vaccines focus on preventing one particular strain of the flu from infecting you, but creating them is a long process that often only produces usable vaccine after the most urgent need for it has passed, as we saw with the H1N1 swine flu. Even if you do manage to get vaccinated against the strain that is going around, it will only be back the next year, having mutated intto a completely different strain, making last year's vaccine useless. To try and prevent the problems of the current system, scientists have been working on creating a single vaccine that will increase your resistance to any strain of the flu. Using the virus Vaccinia as a carrier strain, the Oxford team sent proteins present on all forms of the flu virus into the body. The Vaccinia virus, instead of simply playing host to the flu proteins, also triggers massive white blood cell growth, and the combination of flu proteins and white cell growth leads to a huge number of extra white cells, all trained to fight every form of the flu. The effective difference between this vaccine and a normal vaccine is slight, but important. Normal vaccines prevent the flu virus from infecting you at all, prompting the virus to evolve more rapidly to ensure its survival. The new vaccine, because it is less effective against individual strains of flu, allows the virus to infect you but prevents any symptoms beyond a runny nose. Because of its moderate success in infecting you, the virus has less pressure to evolve. In fact, the periodic attempts at infection by the flu virus would act like a booster shot, updating our white cell's antibodies and knowledge of viruses. 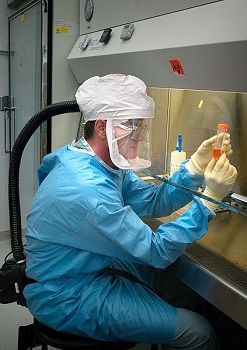 The Oxford group is currently running human tests on the new vaccine to ensure it is safe to use.